For a super emollient, triple-concentrated, exceptionally mild hair and body soap with enriched conditioner to give your hair a glorious sparkling beauty, glowing with the luster of perfection, health and cleanliness. Manufactured from the highest quality ingredients, melted and blended together for environmentally safe unsurpassed earth and body friendly cleaning. Five Star Shampoo nourishes the hair to restore luster, spring, body, and manageability while retaining essential moisture balance. 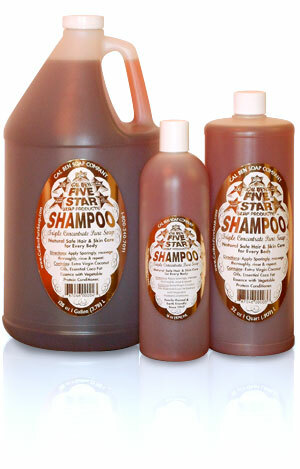 Five Star Shampoo is as close as possible to the Ph of human skin so as to be virtually harmless to scalp and eyes. It treats your hair as gently as your skin. Can and should be used by the entire family. Formulated for use on all types of hair. Five Star Shampoo removes excess oils, pollutants, and styling residues without overstripping. It combines deep cleaning with softness and leaves no dulling film on your hair to act like a magnet and re-attract dirt. Five Star Shampoo fights hair pollution. Made with a maximum of rich vegetable protein conditioners to penetrate and strengthen the hair shaft where needed. Wet hair and scalp thoroughly. dispense shampoo in palm of hand - about the size of a quarter - and rub palms together. Apply to hair and massage thoroughly. This should remove or loosen any excess natural hair oils, lotion, or styling residues. Rinse and repeat for a super lather. Rinse well. Five Star Shampoo is designed to do its whole efficient cleanup job with just a quick two-minute washing. If you have a dandruff problem, consult your doctor. Bubble Bath: Squirt small amount of Shampoo into bathtub as the water is pouring in. Blankets: For the cleanest, fluffiest woolen blankets you have ever seen, wash them in your automatic washing machine in cold, cool, or lukewarm water for 3 minutes or shortest cycle, with just a small amount of Shampoo Concentrate. Rinse blankets not more than 3 minutes once or twice in the same degree of water, then dry. Rug Shampoo: 2 tablespoons Five Star Shampoo to each pint of water produces a rich later for complete soil removal. Vacuum after lather dries.